The Polls Are In, And You Win! As the country closes out a very dramatic general election, you may be tired of hearing about ‘polls’. However, polls are a critical method of capturing voter sentiment over the course of a campaign. Wait… hear us out… we promise this is not a political expose. Typically, polls appear in the news as a means of letting the voting public know which candidate is likely to win the election, but the real value of polling isn’t for the public—it’s for campaign managers and advisors. Changes in the polls give campaign managers valuable insight into how a candidate’s actions impact voter sentiment. Want to know how a candidate performed in a debate? Check for changes in polling numbers before and after the debate to find out. Need to understand how a radical statement impacted a candidate’s chances of winning? Watch for dramatic polling changes to better understand when it might be time to do damage control. Polls are an extremely useful method of capturing sentiment. Whether used for a presidential campaign or… aha! 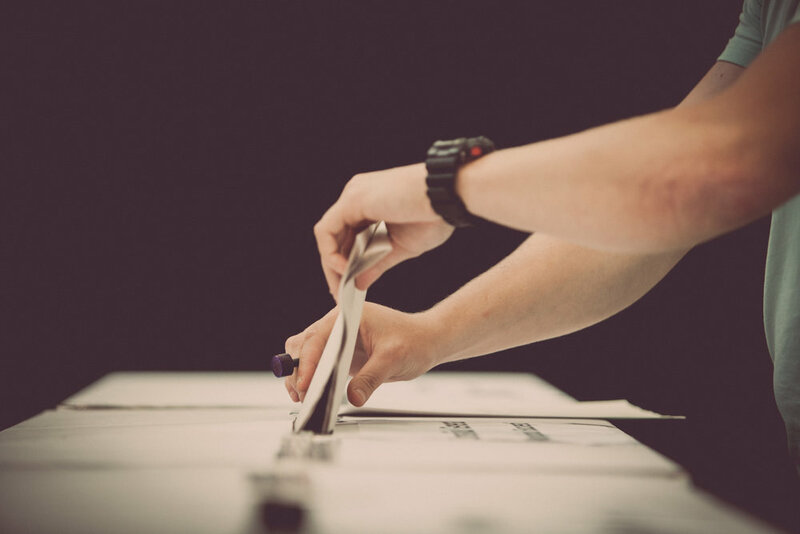 your corporate event or briefing, polling provides insight into what is/isn’t effective, allowing you to shift quickly when results aren’t in your favor. And the best part is that people like polls. They’re an anonymous way to express opinions and a fun way to determine if your opinion is shared by others. Let’s look at how using polls before, during, and after your corporate event or briefing can help you swing sentiment in your favor, capture valuable data, and improve not only your current event but future events as well. What sessions are people most excited about? What sessions just aren’t compelling? The best way to know is to simply just ask. By polling your audience, you can find out what sessions they’re planning to attend, what sessions they’re planning to skip, or hey - even what they want to eat for lunch during the event. This information allows you to react quickly and swiftly if general sentiment isn’t in your favor. When you have a sense of what attendees are looking forward to (or dreading), you can update your agenda appropriately or even order in some healthy snacks for your afternoon session if that may be the case. You can also market popular sessions more heavily to build excitement. Polls are highly interactive and allow attendees to participate in sessions without interrupting. And with the advanced technology landscape, speakers can ask questions and audience members can answer the question via a poll with results appearing in real-time through a mobile app. This increases engagement, creates excitement, and encourages conversation and community during sessions. Polling also allows you to engage with more introverted audience members. Casting an anonymous vote on a poll allows introverts to engage and participate, making them feel more involved without forcing them to speak or raise their hand in front of a large crowd. Polling attendees after your event is a great way to collect data that can help you improve future events, continue the conversation with attendees, and determine whether or not an event was successful. If you polled your audience before the event, you know which sessions people were the most excited about, but did the sessions live up to expectations? How likely would your audience be to attend future events or recommend future meetings to friends and colleagues? This feedback will provide you with actionable insights for planning future events that allow you to continuously improve offerings, fully satisfy attendees, and grow event participation. As the largest generation, Millennials are increasingly important in brand success. Statistics show Millennials are more inclined to prefer brands that engage with customers and offer a personalized experience: 62% of Millennials are more likely to be loyal to brands that take the time to engage with them, and 85% are more likely to purchase if an offer is personalized to their interests. Polls enable improved engagement and provide the data required for effective personalization, making them useful not only for event planning and execution, but also for long-term loyalty. By collecting customer sentiments before an event or briefing, increasing participation during sessions, and amassing information on what attendees want to know more about after the event ends, polling provides valuable contextual information through a means that’s a lot of fun for consumers.